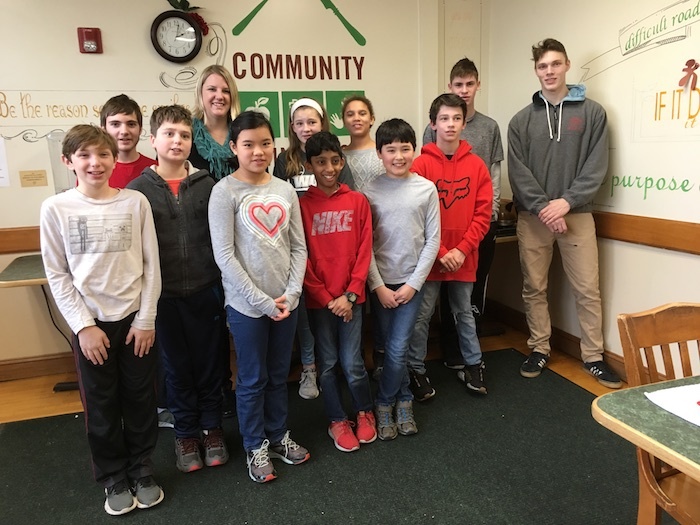 On January 17, 2019, students from Connecticut Experiential Learning Center (CELC) Middle School were lucky enough to volunteer at the Community Dining Room in Branford. CELC regularly invites the students to experience different things as part of the experientially- based curriculum; this time it was to volunteer at the Community Dining Room. The CELC team joined with other volunteers to serve the day’s meal: soup, salad, meatloaf, potatoes, and dessert. People who volunteer at the Community Dining Room are friendly and like helping others. Just one hour of help at the Community Dining Room can change a person’s day. The warm feeling that comes from helping at the Community Dining Room is comforting. Some people who are served express a kindness from the heart that is shared when talking to the volunteers. The Community Dining Room provides a lot of things, including a comfortable dining space, friendly faces, different personalities, a meal, kindness, warmth, and socializing experience. Find out more about the Community Dining Room and how to be of service to others! Branford delivers one hot meal and one frozen meal, 3 days a week. North Branford delivers one hot and one frozen meal, 1 day a week.